"A Pup For Every Person And A Person For Every Pup"
On March 6th, Shout! 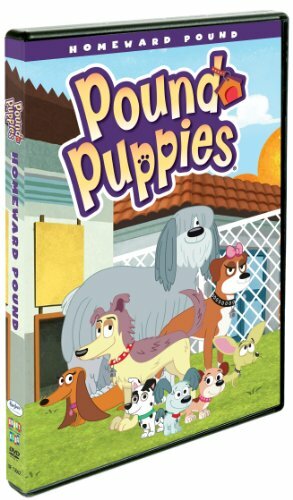 Factory Kids in collaboration with Hasbro Inc. releases Pound Puppies: Homeward Pound on DVD! This release includes 5 fun-filled episodes featuring the pro-active pooches of Shelter 17, and the brand new "Learn to Draw Lucky" bonus vignette. These pups won't leave adoption in the hands of the humans! The Pound Puppies series is currently airing on The Hub in the U.S. and YTV in Canada. The DVD release marks the North American home entertainment debut of Hasbro Studios' hit show. Hasbro, Inc. (NASDAQ: HAS) is a branded play company providing children and families around the world with a wide-range of immersive entertainment offerings based on the Company's world class brand portfolio. From toys and games, to television programming, motion pictures, video games and a comprehensive licensing program, Hasbro strives to delight its customers through the strategic leveraging of well-known and beloved brands such as TRANSFORMERS,LITTLEST PET SHOP, NERF, PLAYSKOOL, MY LITTLE PONY, G.I. JOE, MAGIC: THE GATHERING and MONOPOLY. The Hub, Hasbro's multi-platform joint venture with Discovery Communications (NASDAQ: DISCA, DISCB, DISCK) launched on October 10, 2010. The online home of The Hub is www.hubworld.com. The Hub logo and name are trademarks of Hub Television Networks, LLC. All rights reserved. Come see how we inspire play through our brands at http://www.hasbro.com. (c) 2012 Hasbro, Inc. All Rights Reserved. Shout! Factory is a diversified entertainment company devoted to producing, uncovering and revitalizing the very best of pop culture. Founders Richard Foos, Bob Emmer and Garson Foos have spent their careers sharing their music, television and film faves with discerning consumers the world over. Shout! Factory's DVD offerings serve up classic, contemporary and cult TV series, riveting sports programs, live music, animation and documentaries in lavish packages crammed with extras. The company's audio catalogue boasts GRAMMY(R)-nominated box sets, new releases from storied artists, lovingly assembled album reissues and indispensable "best of" compilations. These riches are the result of a creative acquisitions mandate that has established the company as a hotbed of cultural preservation and commercial reinvention. Shout! Factory is based in Santa Monica, California. For more on Shout! Factory, visit shoutfactory.com.